My New Rock - . Yesterday I was at the hippie crystal store with some girlfriends and I bought this rock. 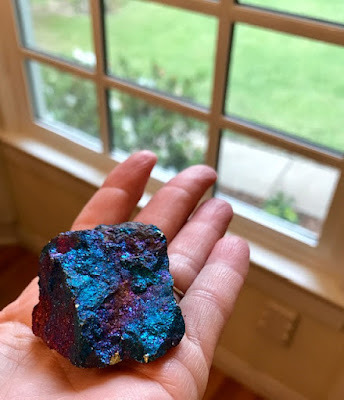 It's called Peacock Ore but it 100% looks like a rock from the parking lot someone spray painted and threw some glitter on. But it isn't. Probably. The internet says, Peacock Ore is also known as Bornite - a copper iron sulfide mineral commonly found in hydrothermal veins and contact metamorphic rocks which tarnishes to iridescent shades of blue, purple, green and gold. Sure is pretty. For a rock.